By the time I left Keene last night, the several inches of snow we’d gotten throughout the day had already begun to melt. There was enough accumulation that I had to brush off my car…but the snow was wet, destined to melt. By the time I got to Newton last night, the half-inch of snow they’d gotten was gone, with nothing left as proof but cold, wet leaves. 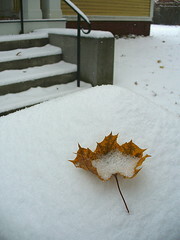 That’s the trick with autumnal snow: it’s ephemeral, merely a harbinger of snowfalls to come. Soon enough, I’ll be tired of digging out my car, but last night, the novelty of the season’s first snow prevented any sense of tedium. On the roads yesterday, drivers seemed careful and unsure, spinning wheels when they accelerated too roughly. “How are the roads,” the woman at the apothecary asked yesterday afternoon when I arrived in a snow-sprinkled hat. “I don’t know,” I answered, “I’ve only walked in it.” In a matter of weeks, drivers will revert to their usual carelessness, and clerks won’t ask how you got to their shops. Yesterday, though, there was a mood of awe-inspired fragility as everyone re-remembered how to walk, drive, and cavort on snow. Thank goodness we’ve had months of leaf-fall to practice for the snowfalls to come. Click here for a photo-set from yesterday’s snowfall. Enjoy! Yes, we soon forget that initial joy amid the scraping and shoveling, slipping and shivering. Wait until it’s February… Meanwhile, still enjoying it. Thanks for the snow pix.